Pepe Lopez formed a masked tag team known as “The Blue Infernos” with Gypsy Joe . 1969: Pepe Lopez formed a masked tag team known as “The Mighty Yankees” with Tony Russo (unmasked by The Spoilers). 1976: Pepe Lopez formed a masked tag team known as “The Dominos” with Frank Hester managed by J.C.Dykes in Tennessee. Pepe Lopez was in other masked tag teams such as Los Medicos (with Tony Gonzales), The Blue Demons. July 27, 1976: Pepe Lopez died in the car accident that also killed Sam Bass and Frank Hester in Dickson, Tennessee. Special thanks to Pepe Lopez’s son, David Rodriguez, for helping with the content on this profile. David Rodriquez wrote: Pepe Lopez was born Reuben Rodriguez in Texas on 6/24/1937, Died near Dickson, Tennessee on 7/27/1976 in the crash with Sam Bass and Frank Hester. Around 5’9″ tall. I know he wrestled in quite a few tag teams; The Blue Terrors in Tenn. 1969, The Mighty Yankees in Tenn, 1969 (unmasked by The Spoilers as Pepe and Tony Russo), Los Diablos in Gulf Coast 1973, The Blue Demons, The Blue Scorpions, The Dominoes, and a good run with El Medico, and with Big Bad John (tag team titles 2x). 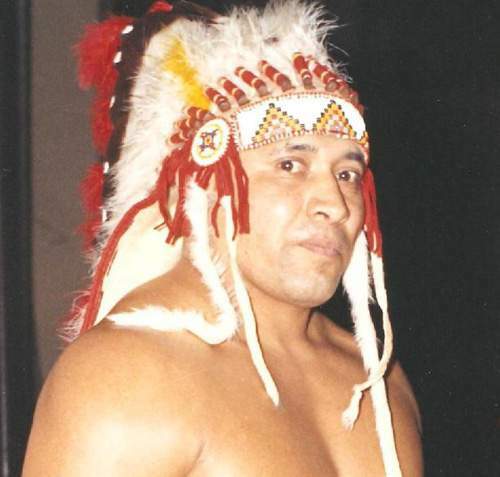 He also wrestled as Jose Lopez, Mr.Pro in Chattanooga, Winterhawk in Japan in January of 76 for IWE, and a very good run as Jimmy Dancing Bear throughout the Southeast from 1969-1974?. As Jimmy, he got a lot of attention in Georgia 73-74.